Pertinent questions are increasingly being asked on what really led to the unceremonious dismissal of Brigadier-General Texas Chukwu, the immediate past spokesman of the Nigerian army. He was relieved of his duty on the wake of the recent Boko Haram onslaughts against army bases in Borno State, Northeast region of Nigeria. Family Writers Press journalists immediately swung into investigation to comprehensively unravel the intrigues behind such a development. 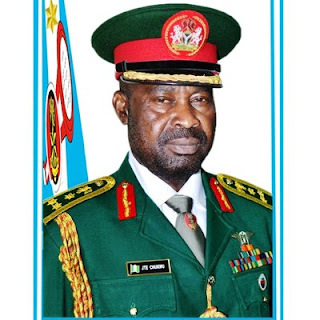 Recall that the Nigerian army authorities recently gave an announcement that Brigadier-General Texas Chukwu, the army spokesman has been relieved of his appointment and replaced with his deputy, Colonel Aminu Iliyasu. The sudden sack of the General who is an Igbo Biafran, triggered serious divergent reactions from the populace. An Abuja based Correspondent of Family Writers Press, on his confirmatory contact with one army officer who gave his name as Sergent Adamu through a voice call, stated that the dismissal of the army spokesman stemmed from the disastrous attacks of the army officers by Boko Haram terrorists. Sergeant Adamu who claimed to be serving under the Directorate of Army's Public Relations, revealed that Brigadier-General Texas Cbukwu was reported to the presidency for his stubborn refusal to announce doctored information regarding army casualties in the hands of the terrorists. As a follow up action and as advisedly ordered by President Muhammadu Buhari, the Chief of Army Staff - Lieutenant-General Tukur Yusuf Buratai, promptly relieved Brigadier-General Chukwu of his responsibility. It was also stated that the sacked General who has been under the watch list of the presidency was regarded as one of the inside informants of the Indigenous People of Biafra (IPOB) and her leader, Mazi Nnamdi Kanu. It was realistically reported to the presidency that Brigadier-General Texas Chukwu was a potential threat to the Nigerian army based on his refusal to obey commands from his superiors which tantamounts to mutiny. Rigorously cross-examined to ascertain the revelations, Sergeant Adamu further revealed that the reason why most press releases of the Nigerian army following the recent disastrous Boko Haram attacks came without official seal, resulted from the refusal of the gravely disillusioned army spokesman to report doctored information to the world. He insisted that the public were fully aware that the Boko Haram fighters killed well over one hundred army personnel and that giving fictitious report about the incident, would amount to ridiculing the integrity of the Nigerian army whose Information Directorate he was managing. It was his deputy, Colonel Aminu Iliyasu that eventually took up the responsibility of making press releases without appended authority as he was yet unconfirmed as the substantial Army Public Relations Director. Pressing Sergent Adamu further to ascertain the likely fate of Brigadier-General Texas Chukwu, he clearly emphasized that the sacked General will face dire consequences for his actions because every Igboman (Biafran) serving in the Nigerian army is already a suspect. He stated that Brigadier-General Chukwu could forcefully be retired in few days time as the leadership of the Nigerian army is largely uncomfortable with his presence in the force. His action is already being regarded as a mutiny. He has before now, been placed under close surveillance by the Military Intelligence. His discontent over the deployment of army officers from the Southern part of the country to troubled areas tensely infested by Boko Haram terrorists with attendant losses of precious lives, was really pronounced. Meanwhile, a Maiduguri based Family Writers Press Correspondent, also put up a contact to an army combatant presently engaged in the fight against Boko Haram terrorists, to sample his opinion on the developments therein. Pleading anonymity, he revealed that there exists a grand conspiracy against Igbos (Biafrans) serving in the Nigerian army. He confided that hundreds of such men are being consistently wasted by the terrorists in what clearly appears to be profiled betrayals by their Northern (Fulani) commanders. He maintained that he has never spoken to the Press before but expressed happiness for engaging Family Writers Press through which alarm could be raised over the dangers they are subjected to, in the Northeast, in their confrontation with Boko Haram. It is obvious he lamented, that the Nigerian media outlets have remained economical in their reportage of the truth within the Boko Haram terrorists enclave called Borno State. The unanimous soldier stated emphatically, that for any Igboman to yet be serving in the Nigerian army till date, amounts to intentional suicide. He collaborated Sergent Adamu's submission that the reason behind the sudden sack of Brigadier-General Texas Chukwu as the army's spokesman, hinges on his intention to release all the names of the soldiers killed by the terrorists, thereby getting their families and friends fully informed. But the military authorities and the presidency bluntly objected to this thereby prompting a doctored report for the media which the General refused to accept. His successor, Colonel Aminu Iliyasu who has already assumed the office , can therefore conceal all that transpired, from public knowledge. The anonymous soldier further decried the fate of Igbo (Biafran) junior officers that are presently facing uncertainties in the army as a result of the absence of Brigadier-General Texas Chukwu who was regarded as a senior and dependable brother ably providing them to an extent, with some protection. Probing further by the Family Writers Press Correspondent to ascertain if the informant himself is a Biafran, he sharply declined but just stated that he was being concerned with the ordeals of Igbo officers serving in the force. It is on this premise that Family Writers Press hereby dutifully call on every Biafran family whose relatives are currently serving in the Nigerian army to constantly put calls across to ascertain if they are really alive or already dead. However, if you are an Igbo person or by extension, from any of the Biafran tribes yet serving in the Nigerian army, this is the time for you to deeply have a rethink as evidences abound of Fulani Islamists controlled Nigeria army, tenaciously carrying out their agenda of wasting most of you under the guise of fighting terrorists in order to drastically reduce your population in the force. This alarm is being distinctly sounded for the wise to take the needed action and now is the time. I wish all the family writer press a happy new month, more grace to your able.